We all know music is kind of magic. It has the power to tap directly into our emotions, and ignite our imaginations. It can make us bust a move, or move us to tears, sometimes in the course of a single song. But that’s not all it can do. There’s growing scientific evidence that shows learning to play an instrument—and piano in particular—can actually make you smarter, happier, and healthier. The cognitive demands of learning piano could help with everything from planning skills and language development to reducing anxiety and even boosting memory! Learning to play piano means teaching your brain how to work on overdrive. Think about all the individual tasks your brain has to perform simultaneously: keeping time, following pitch, forming chords, maintaining posture and controlling your breath, all while your right and left hands are operating independently from each other while ranging over 88 identical little black and white buttons. Also, you might be operating the pedals and reading and interpreting sheet music too. 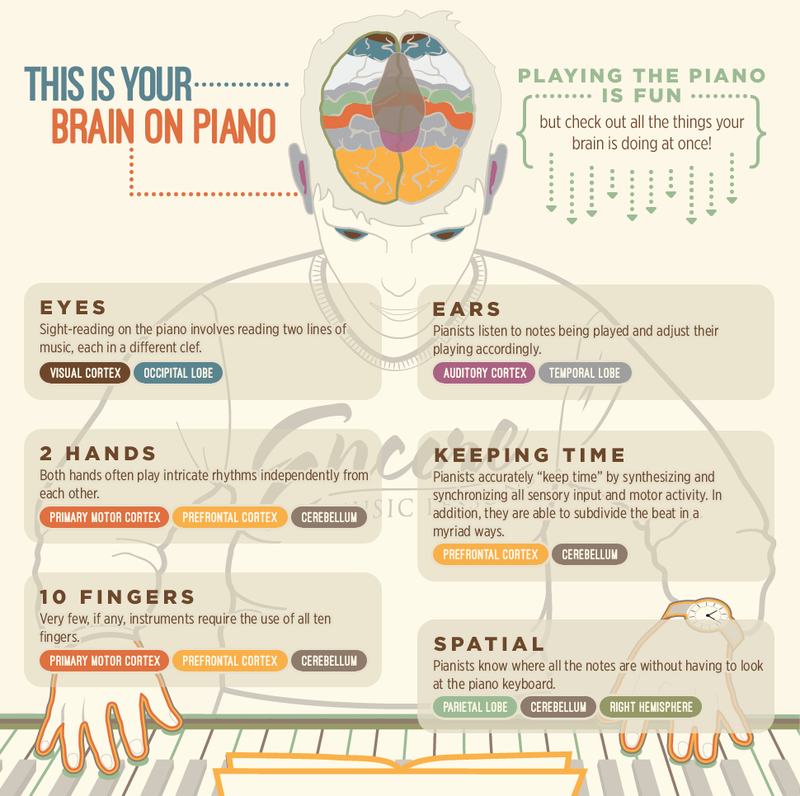 Every time you sit down to play piano, you’re giving your brain a monster workout, exercising your logical, creative, visual, auditory, emotional, and motor functions. Researchers at Vanderbilt University have discovered that musicians are innately proficient in a creative technique they call “divergent thinking, which is the ability to come up with new solutions to open-ended, multifaceted problems.” Their work suggests that because playing music enhances communication between parts of the brain, musicians literally think about complex problems differently, and come up with more creative solutions. While learning piano at a young age is a great way to develop discipline, self-esteem, and academic skills, it’s never too late to benefit from the power of playing. Adults who learn to play piano experience a decrease in depression, fatigue, and anxiety and an increase in memory, verbal communication, and a feeling of independence. Playing piano can also help alleviate symptoms of dementia, PTSD, and stroke, by improving cognition and dexterity, and reducing stress. Tickling the ivories may not give you superpowers, but it’s clear that learning to play piano is one of the most powerful ways to exercise your mind, and soothe your soul. If you’re interested in learning piano, Pianu Academy offers interactive lessons that let you hone your skills at your own pace.